Clianthus, commonly known as Kakabeak, is a plant genus comprising two species of woody legume shrubs native to New Zealand. They have striking clusters of red flowers, which resemble the beak of the K?k?, a New Zealand parrot. 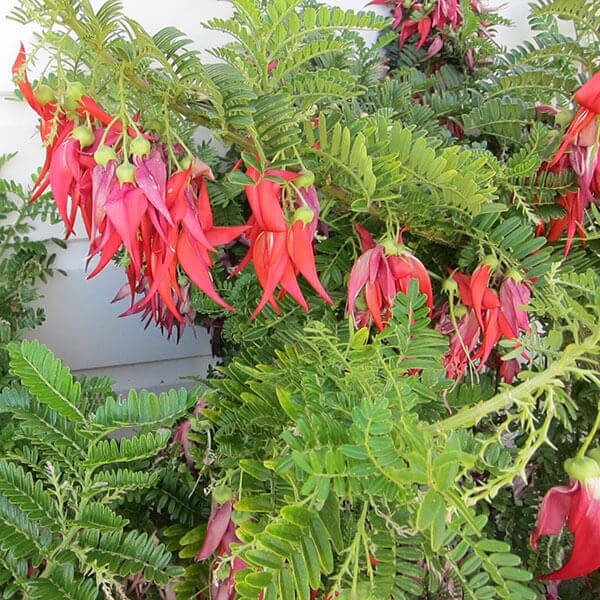 The plants are also known as New Zealand Glory Pea, Parrot's Beak, Parrot's Bill and Lobster Claw. There is also a variety with white to creamy coloured flowers. Kakabeak grows to around two metres high, with spreading branches producing leaf stalks up to 15 cm long bearing several pairs of small leaflets. They usually flower from spring through to early summer, but can flower twice a year or even year round. Joseph Banks and Daniel Solander collected specimens of Clianthus in 1769 and C. puniceus was described in 1835. Flowers from spring through to summer's end. Pea shaped flowers in chains of 5 - 10 flowers. This plant will NOT tolerate wet feet. A great plant for a rockery. Requires full sun to part shade. Clianthus Puniceus Red Form - Striking red 5 - 10cm Scarlet Pea shaped flowers.